On this page, I want to take a little time to explain what is a big problem in the dwarf hamster pet market. I hope you will take the time to read more about it. What is a hybrid dwarf? A hybrid is an animal created by breeding two different species together. There are only 2 species of hamster that can be bred together, the Winter White Russian Dwarf and the Campbells Russian Dwarf, which is because they have similar numbers of chromosomes. Sometimes, people confuse the word 'species' with 'breed'. Different breeds of dogs may be successfully bred together without problems because they are different breeds of the same species, rather than completely separate species. Breeding separate species together is more like breeding a horse and a donkey together. Because the breeding of these hybrid hamsters has been happening for so many years, most pet shops do not even know that there were originially 2 separate species of Russian Dwarf. Now you may think 'so what? ', but the breeding of hybrids really is a big problem for a number of reasons. Firstly, there can be problems with giving birth as the 2 species are not the same size and do not have the same sized babies. Mothers can die from giving birth to hybrids because the babies are simply too large for her to push out. This is an awful, agonising death and those who have witnessed the mother's screams never forget them. Secondly, there is the fact that most hybrids do not live long and healthy lives. They may look fine when you buy them from the pet shop, but at some time in their lives they may develop any number of health problems, common ones being neurological issues. Neurological problems are the cause of behaviours such as head-tilting, spinning around in circles or back-flipping. A lot of videos get posted online of hamsters displaying these so-called 'hilarious' antics, but it is not funny in the least. The hamsters are behaving like that because they are sick and they have a compulsion to do these things. That is, they cannot stop doing it. Think about how you would feel if you could not stop your legs from moving and forcing you to run in a circle all day. Along with neurological issues can come many other health problems and hybrids often die young. Thirdly, the breeding of hybrids also promotes the extinction of the separate species, which is terrible as the two species are totally different, both physically and behaviourally. The pure species are only kept alive due to the dedication of show breeders in this country. Without shows, I dread to think what would happen to these beautiful animals. Again, some people may say 'so what if you lose the pure species?' and in response to this I would ask them to imagine that it were possible to inter-breed cats and dogs, creating a hybrid species called a 'cag'. Now imagine that pure cats and pure dogs die out and all you can buy is a cag. Wouldn't it be terrible if cats and dogs were extinct and you could never buy a cat or dog again? Hamster lovers like myself feel passionately about these two species, either for one or both, and would be devastated to lose them. What can be done about the issue of hybrids? The best thing to do is to avoid buying hybrids, which can be difficult depending on where you live. 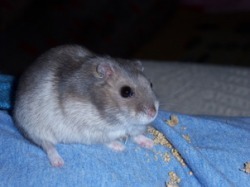 Almost all dwarf hamsters in pet shops and from non-showing breeders are hybrids. Many non-showing breeders advertise pure dwarfs that are actually hybrids. They are not necessarily trying to con you; they believe their hamsters to be pure because they have been told as such by other non-showing breeders who have sold them stock. However, if you go far enough back (or not that far in most cases), there is likely to be some pet shop animals somewhere in the line. The only way to be sure of getting a pure dwarf hamster is to purchase one from a hamster show or from a show breeder recommended by a National Hamster Council affiliated club (see Links). A show breeder will usually register a show 'prefix' after they have been a member of a NHC affiliated club for over a year (they cannot do so before this). They then get a certificate from the NHC showing their name, address and prefix, which is really the only way of proving that a breeder also shows. It does not prove that their stock is pure, but it can still be worth asking for this certificate as I don't personally know of any pure dwarf breeders who don't have one. Unfortunately, there is no definitive method of spotting a hybrid and even experts can be unsure. Some hybrids can look like a Campbells, like a Winter White or like a mixture of both. Sometimes it's easy to spot a hybrid and sometimes it's impossible. The easiest hybrids to spot are ones who have the colours and patterns of one species on the body shape of another, for example 'mandarin Winter Whites', which have the body of a winter white with the orangey colour of an argente Campbells. The picture shows a hybrid dwarf, who looks exactly like a sapphire Winter White. He was even able to change into a winter coat, as can many hybrids, depending on which specific genes they have from which species. This hamster is a rescue dwarf of mine and on adopting him I was told that he was a pure Winter White. Of course, he cannot be as he is from a pet shop originally. In some other European countries, a dwarf can be labelled as pure if it has 6 or more generations of pure-bred hamsters in its ancestory. This is how you may sometimes see mandarin or mushroom Winter Whites labelled as pure. However, in the UK, hamsters are considered hybrid if they have any genes at all from another species, anywhere in their ancestory. Hybrids cannot be shown in the UK and any animal seen to be an obvious hybrid will be disqualified from the show.